This three-lined potato beetle was found on Sacred Datura (Datura wrightii), May 2008 near Mesquite Wash, Maricopa County, Arizona. At the tip of the leaf another insect can be seen, a light green mirid, or plant bug. 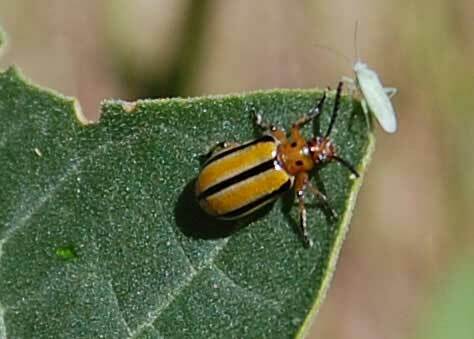 Leaf beetles of many kinds are found in the Sonoran Desert. This species specializes in feeding on the leaves of the nightshade family (Solanaceae). Solanaceae mostly are pretty toxic especially to vertebrate herbivores owing to the presence of alkaloids. Like many insects that eat toxic plants the bright coloration might be a warning that it too has toxic substances within, sequestered from the plant. The pronotum (segment behind head) is dark orange with usually two dark spots. The elytra are lighter orange with three black stripes. It is very similar to the Three-lined Lema Beetle, Lema trivittata.